LAS VEGAS (June 24, 2015) – The National Hockey League Players’ Association (NHLPA) announced today that Carey Price is the 2014-15 recipient of the Ted Lindsay Award, presented annually to the “Most Outstanding Player” in the NHL as voted by fellow members of the NHLPA. Jamie Benn of the Dallas Stars and Alexander Ovechkin of the Washington Capitals were nominated by the members of the NHLPA as finalists for the 2014-15 Ted Lindsay Award. 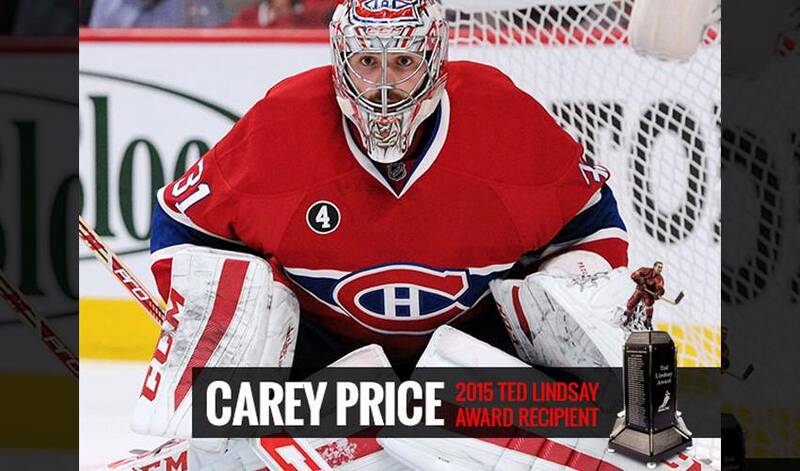 Following an outstanding eighth season in the NHL, this is the first Ted Lindsay Award for Price. This marks the fourth time in the history of the Award that a goaltender has been named as the “Most Outstanding Player”, following Mike Liut (1980-81) and Dominik Hasek (1996-97, 1997-98), and the first time in 17 years. In being named as the 2014-15 recipient of the Ted Lindsay Award, Price becomes only the second Montreal Canadiens player to be recognized by the members of the NHLPA with their highest honour, following three-time “Most Outstanding Player” recipient Guy Lafleur (1976-77, 1977-78, 1978-79). As part of the 2015 NHL Awards from the MGM Grand Garden Arena in Las Vegas, Hockey Hall of Fame member Ted Lindsay was on hand to present his namesake Award to Price. Benn and Ovechkin were also in attendance. During the 2014-15 regular season, Price played 66 games and helped lead the Canadiens to the second-best record in the NHL. Price led the league in wins (44 – a new franchise-best), goals-against average (1.96) and save percentage (.933), which also earned him finalist nominations for the Hart Memorial Trophy and the Vezina Trophy. The Ted Lindsay Award is the only award voted on by the players themselves, carrying on the tradition established by the Lester B. Pearson Award since 1970-71. The Award honours Ted Lindsay, an All-Star forward known for his skill, tenacity, leadership, and for his role in establishing the original Players' Association. In recognition of being named the 2014-15 Ted Lindsay Award recipient, Price will also receive an elegant men’s watch from Breitling. Height: 6’3” Weight: 216 lbs. Whether it’s from within or from others, NHLPA members Paul Byron and Jake Gardiner know all about dealing with the stresses of everyday demands. The family friend Max Domi would want to be cast to play him in a movie about his life, and the former player he'd most want to be teammates with all in his Player Q&A!